Tales of the Cocktail set ‘em up, and The Spare Room knocked ‘em down. The 10th anniversary edition of the acclaimed festival kicked off in spectacular fashion with Ode to the Bowl, hosted by The Spare Room co-owners Med Abrous, Marc Rose, and beverage director Naomi Schimek. 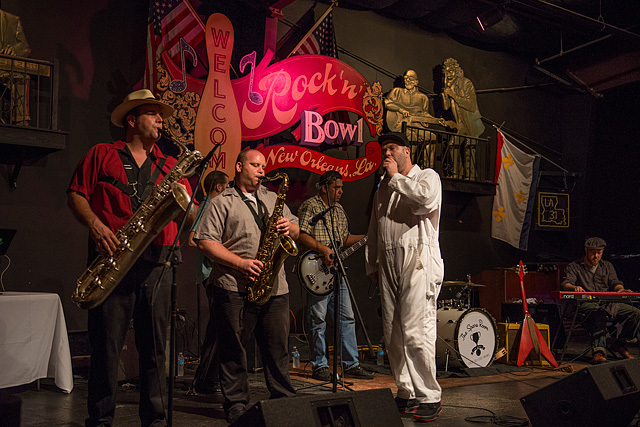 Ode to the Bowl featured twelve teams from across the country competing in a raucous bowling tournament at the historic Rock ‘N’ Bowl in New Orleans. 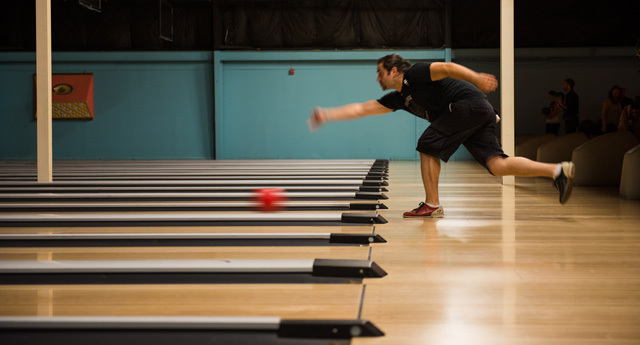 The Spare Room (a 2012 Spirited Awards Finalist for World’s Best Hotel Bar) is well-known for having its own vintage lanes inside its Hollywood Roosevelt location, so Ode to the Bowl was an event right up its alley. Team captains included Los Angeles kingpin Aidan Demarest (Neat), San Francisco’s Jesus Ryan Fitzgerald (Beretta), Miami’s John Lermayer, and LUPEC’s fearless leader, Misty Kalkofen (Boston’s Brick & Mortar). 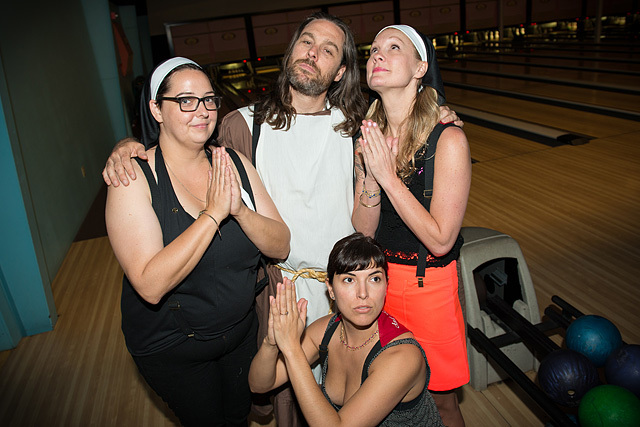 Alas, San Francisco’s “Sweet Jesus and the Holy Rollers” didn’t have a prayer. Spotted in the crowd were Ron Cooper (Del Maguey Single Village Mezcal), David Kaplan (Proprietors LLC), Chad Solomon and Christy Pope (Cuffs & Buttons) and Alie and Georgia (Cooking Channel’s Classy Ladies), among many others. The Los Angeles crew was in the house in force, a harbinger of the strong presence the City of Angels would carry throughout Tales. The Spare Room knows bowling. 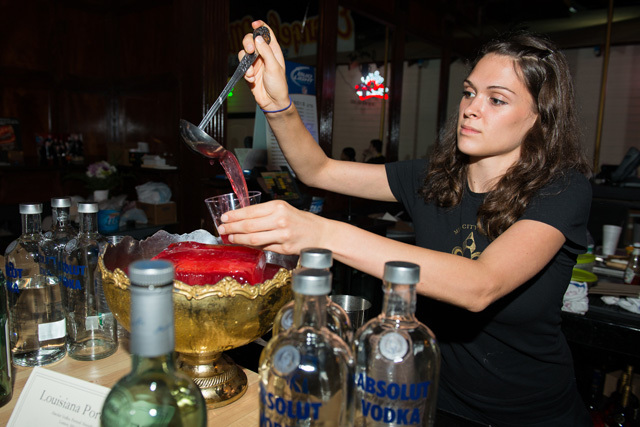 Guests enjoyed The Spare Room’s signature punch bowls, including the Hedgerow Bustle (Absolut Vodka, Darjeeling tea, blackberry juice, champagne vinegar, sugar, Leaves of Provence) and the Louisiana Porch Swing (recipe below). King James and the Special Men kick out the jams. 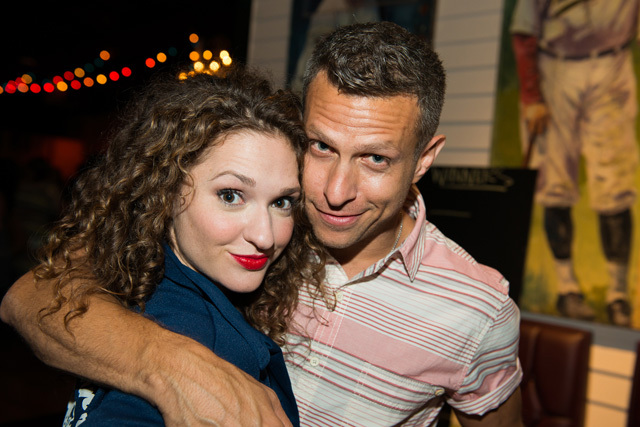 The Spare Room bartender Lauran September and co-owner Marc Rose. 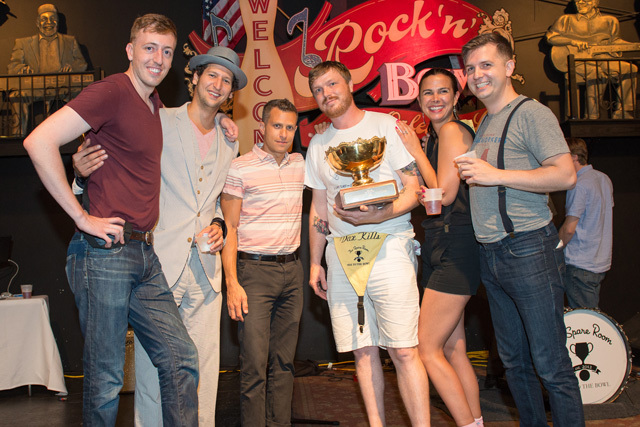 Med Abrous (in hat) and Marc Rose present Team “Dax Kills” of New York the trophy. Ode to the Bowl was a fantastic event, energized by the anticipation of the spirited week that lay ahead and warmed by the communal vibe of friends old and new gathering over punch and a few frames. Word is that The Spare Room has been invited to bring Ode to the Bowl back to next year’s Tales, so start working on that hook! 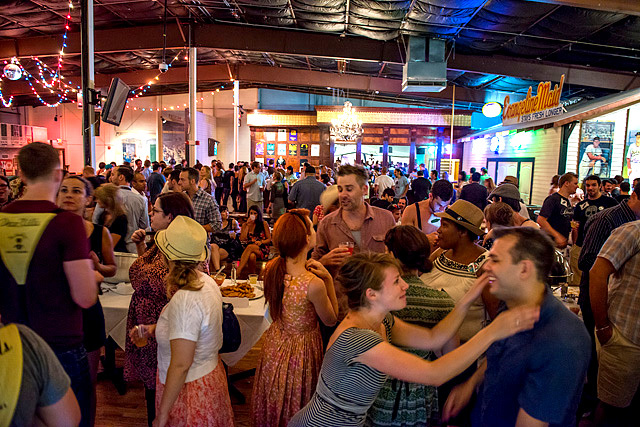 Proceeds from Ode to the Bowl benefited the Tales of the Cocktail Apprentice Program scholarship program. Take the peel of 4 lemons and muddle into 1.5 cups sugar. Let stand one hour. Add 10 oz. lemon juice, stir until dissolved, and strain out rinds. Place 20 sprigs of mint into large vessel, and lightly muddle. Add the lemon syrup, 30 oz. peach melba tea (Schimek sources from Chado Tea Room), 5 oz. Pernod Absinthe, and 20 oz. Absolut Vodka. Shake to dilution and temperature (The Spare Room uses 64 oz. cobblers for this purpose). 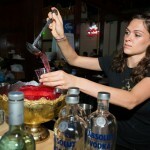 Strain into punchbowl over a block of ice. Garnish with lemon roses created from the unbroken spiral rinds from whole lemons, held into place with a toothpick. Tip: Prior to assembly, Schimek uses a shaker tin and hot water to create an indention in the top of the ice block that serves as a nest to display the lemon roses.